These five plants should all be nearly genetically identical (from a single inbred line). Lots of different things can cause albino corn. From defects in chlorophyll (the pigment that plants plants green) biosynthesis to defects in how the chloroplasts themselves (the plant organelles where photosynthesis happens) divide. One of the frankly awesome things about working with corn is that these sorts of mutants actually survive long enough to study, even though most (all?) of them ultimately prove lethal. In arabidopsis, mutations of most of the same genes wouldn’t even survive through germination. Alice Barkan’s lab estimates there are ~600 maize genes whose mutation produce reductions in chlorophyll (generally resulting in either yellow or white plants). <– click that link if for no other reason than to see a frankly beautiful photo showing the variation in shades of maize seedlings from healthy green through sickly yellow to pure snow white. All that said: when you start seeing albino plants pop out in a batch of what should be genetically identical plants (all from the same inbred line), it’s a pretty good sign that particular batch of seeds is hiding some unrecorded complexity rather recently within its family tree. I have been raising a variety of multi-color flint corn passed down through my husband’s native north american tribe (HoChunk) for 6 years. I live near the Mississippi R. in Wisconsin. I plant them in 7 raised circular (about 2 ft high by 4-5 ft diameter) mounds in the traditional 3 sisters method. This year I got the seed in the ground a bit later than usual due to weather conditions. 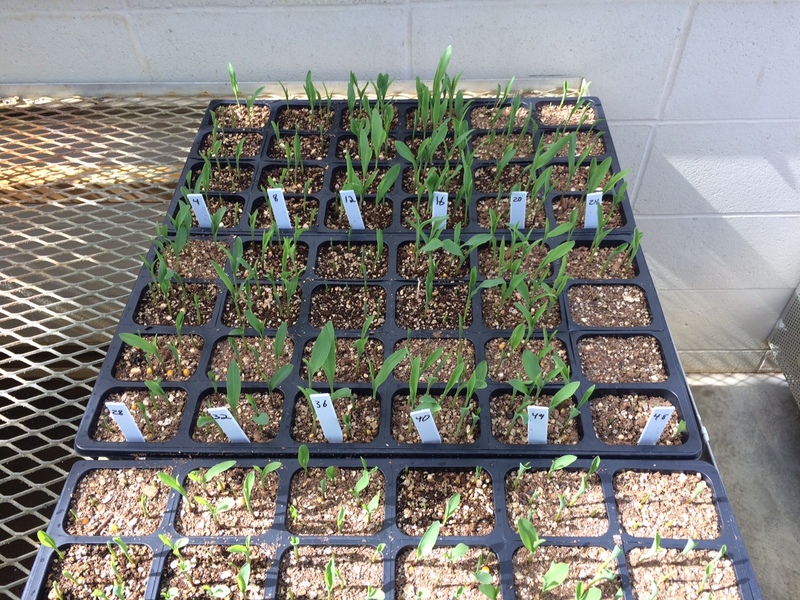 The seedlings began emerging early this week. I now have 4 albino seedling that have emerged, no two in the same mound. Is this an unusual occurrence? The seeds in each mound are from different corn cobs. I don’t keep tabs on the original plant each corn cob came from so each mound may contain kernels from the same plant from last year. I tend to separate the cobs and kernels by color variations I like and plant like variations in the same mound. eg. purple husk corns, yellow husk corns, glassy kerneled corns, many colored kernels and alway one mound with a mixed variety so to maintain some diversity in pollination. In my experience it is not terribly unusual to see a few albino seedlings pop up, particularly when working with older batches of seed for whatever reason. It’s when you start seeing 1/4 of the seeds in a particular batch come up white that I start to worry there was either a mix up of seeds or pollen contamination two generations ago that brought in a mutant allele that’s now segregating out. When you say “older batches of seed” do you mean seed held over from two or three years prior, or seed from heritage varieties. The seed corn was from last years harvest. I have carefully selected out any dent corn that shows up each year since I suspect these were from errant pollen of nearby commercial fields though I realize it may have been just the genetic variability in the original seed. Since I now have 4 I am considering whether to attempt feeding a glucose solution through a trimmed leaf submerged in a vial of a glucose solution (…just for curiosity sake) to see if I can extend longevity. All of the seedlings are white. No yellow or pale seedlings. You’re right that was an unclear way to phrase it. I meant physically old kernels that have been sitting around for a couple of years, not old varieties. Pure white tends to indicate a defect in actually making chloroplasts. If you disrupt the biosynthesis of chlorophyll, the carotenoids are still producted to give a yellow color. Good luck with your feeding experiment!